With over 40 years of experience, Termostav-Mraz is considered to be one of the leading companies in central Europe to provide refractory installations paired with high-quality applications in industrial thermal insulations. As a constructing company, we pay maximum attention to the safety and quality of our works, and aim to have the lowest possible impact on production conditions if the repaired aggregate is still operating. We have vast experience in the power, iron, steel, chemical and building materials industry. We provide a broad range of services in all kinds of repairs, from refractory maintenance to turnkey projects for refractory needs, including design, supervision, installations and logistics, which can be tailored to the requirements of the investor. With a team of 180 specialists who are full-time employees, we ensure that quality, safety and completion date are never an issue with Termostav-Mraz. One of Termostav-Mraz’s long-term goals has been to create an environment where our specialists gain experience in the various fields refractory materials are being used in. 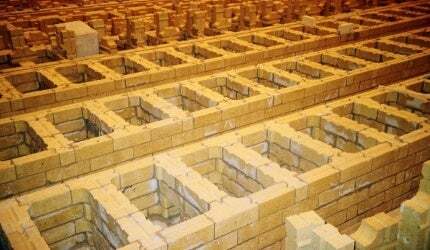 We continuously supply refractory bricklaying services on power and heat boilers of all sizes, as well as coke oven batteries, blast furnaces, glass furnaces and rotary kilns. We are used to dealing with any kind of refractory material installation and environment inside high-temperature aggregates, so whether it is silica, SiC, alumina or magnesia, we have the ability to handle them correctly and understand their specific storage, transportation and installation needs. Precision is the key and we know the damage a few millimeters off the axis, one wrongly put arch brick or an expansion joint that is too narrow can do. With experience in investment projects, we are capable of delivering full-scale refractory supplies, including refractory design, material supply, supervision, material logistics, bricklaying and commissioning. Complete fluid boiler refractory installment, green-field biomass boiler construction, coke ovens through wall repairs, blast furnace general repairs are just a few examples of our experience in providing a full range of refractory services. In our thermal energy production and distribution technological facilities, we meet numerous requirements for fuel saving and thermal loss during power distribution. In this field, we provide thermal and cooling insulation, including surface finishing with an emphasis on heat-saving, environmental protection and safety of the attending personnel against burn injuries. We provide insulation works in all industrial branches, including insulation of steam pipelines, heat distribution, apparatuses, tanks, technological distribution for different media, air-conditioning equipment, insulation of boilers, electrofilters, furnaces, chemical and petrochemical pipeline. When dealing with projects, no matter what their size or scope, we know we are fully responsible and therefore place enormous emphasis on the safety of our refractory and insulating works. Our personnel are educated on a regular basis and undergo detailed training, which has helped us to achieve our ‘zero accident’ track record. All of these facts are taken into account to create a full service package for refractory installment inside of the aggregate, together with high-quality insulation services on the outside. As we offer all of this under one roof, it further limits the direct responsibility of the customer and decreases the number of contractors for a project.